Raspberry Brownie Parfaits make a simple dessert that’s ready in no time. 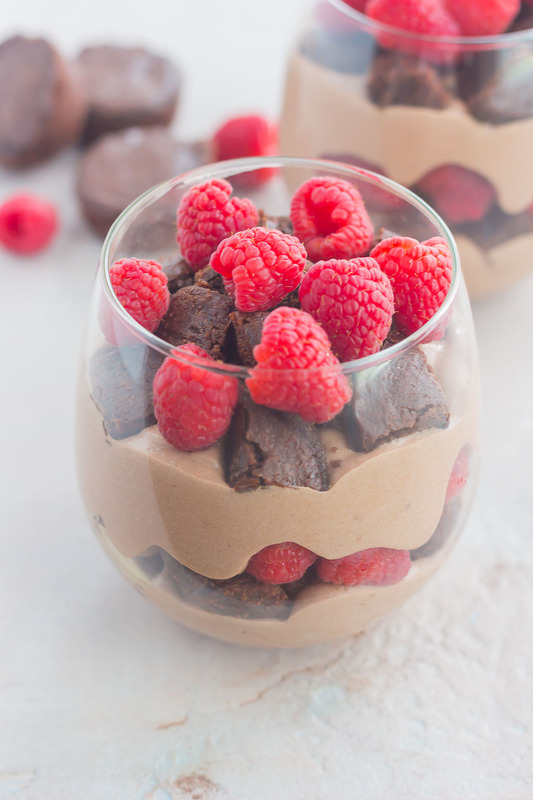 Rich brownie chunks and fresh raspberries are layered together with whipped chocolate pudding to create the perfect sweet treat! Sometimes, you just gotta cave and give in to your sweet tooth. The hubster and I don’t have the biggest sweet tooth, but there are a few tried and true favorites that we both love. Especially the hubster. Have I mentioned that he’s an ice cream fanatic? He went nuts over this No-Churn Salted Caramel Chocolate Chunk Ice Cream and that Funfetti Cake Batter Milkshake. I’ve talked about how we always have a gallon (or three) of ice cream in our freezer due to the hubster’s love for it. But what I don’t think I’ve mentioned before is that he always loves pudding, specifically chocolate pudding! And lucky for him, I do, too. Every once in a while, the hubster will whip up a batch of instant pudding for dessert. Yes, I know it’s not fancy or time consuming, but there’s just something about homemade pudding (ok, it’s instant, so not really homemade, but better than the snak-packs!) 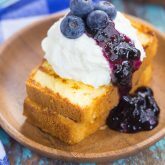 that tastes oh-so good, especially with a big dollop of whipped cream on top! And that’s where today’s recipe inspiration came from…pudding! 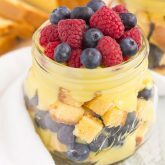 This dessert was adapted from these Berry Vanilla Pudding Pound Cake Trifles that I created two years ago. But, instead of using pound cake, brownies were swapped in, and of course, some chocolate pudding for the vanilla. Can you say easy-peasy or what? You know I’m all about the simple recipes around here, and this dessert is one of the easiest treats that I’ve shared. Using store-bought brownies makes these extra quick, but, you could also use homemade brownies, too, of course! And the chocolate pudding. 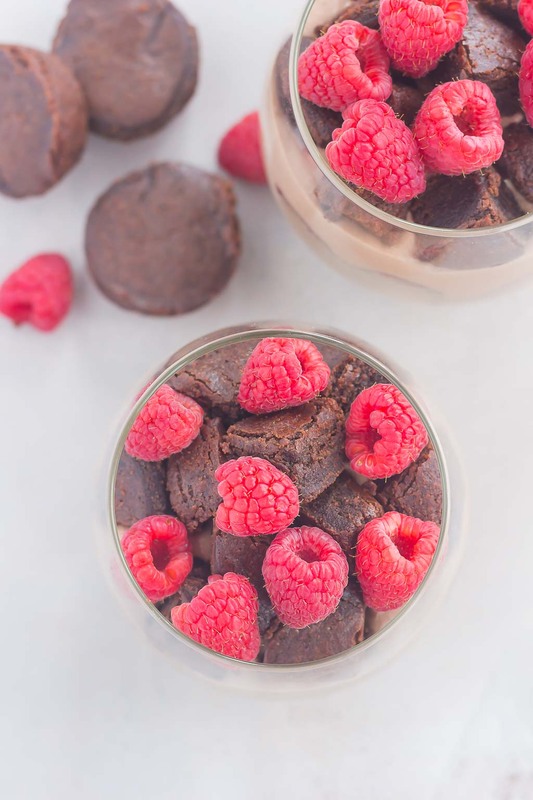 As we discussed, it’s the instant mix kind, which also makes these Raspberry Brownie Parfaits a breeze to whip up. 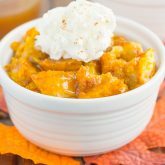 But, to get a little more fancy-ish, the pudding is mixed together with a whipped topping (Cool Whip), which gives it a lighter, fluffier texture. Now, let’s talk about this decadent flavor combination. 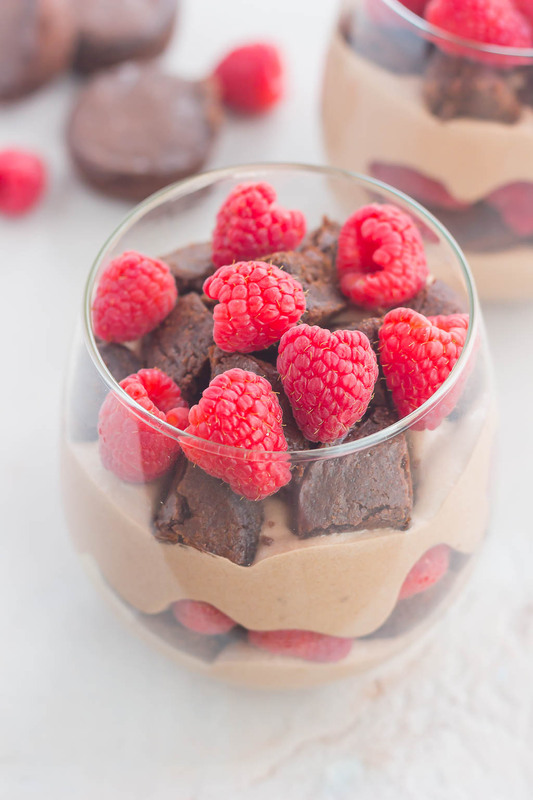 Fresh raspberries, rich brownies, and creamy chocolate pudding. What could be better? The sweet fruit pairs perfectly with the rich chocolate, making it the ultimate party for your tastebuds. Plus, since you can make these in glasses or jars, it’s perfect for portion control, and for not having to share, either! It also makes an impressively easy dessert for those house guests or party-goers. So if you’re looking for that chocolatey, fruity, impressive dessert, these Raspberry Brownie Parfaits will hit the spot. Perfect for summer or for any other time, this simple treat is sure to be a favorite with everyone! 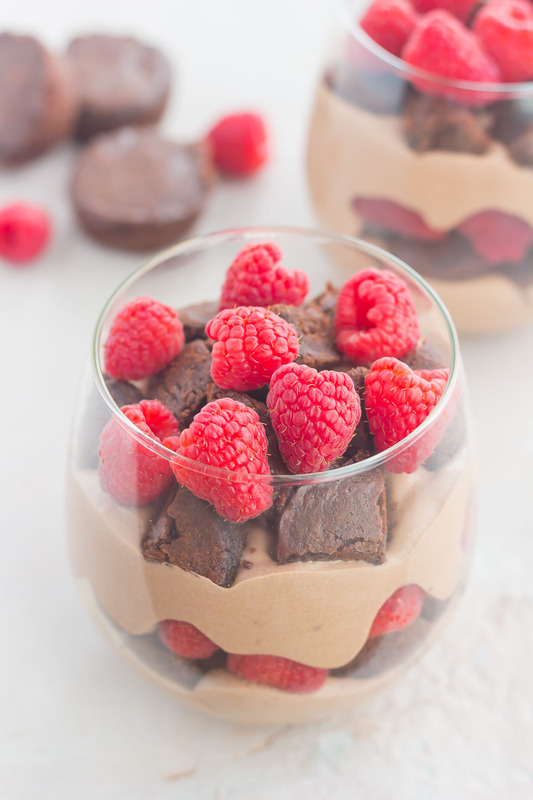 Raspberry Brownie Parfaits make a simple dessert that's ready in no time. 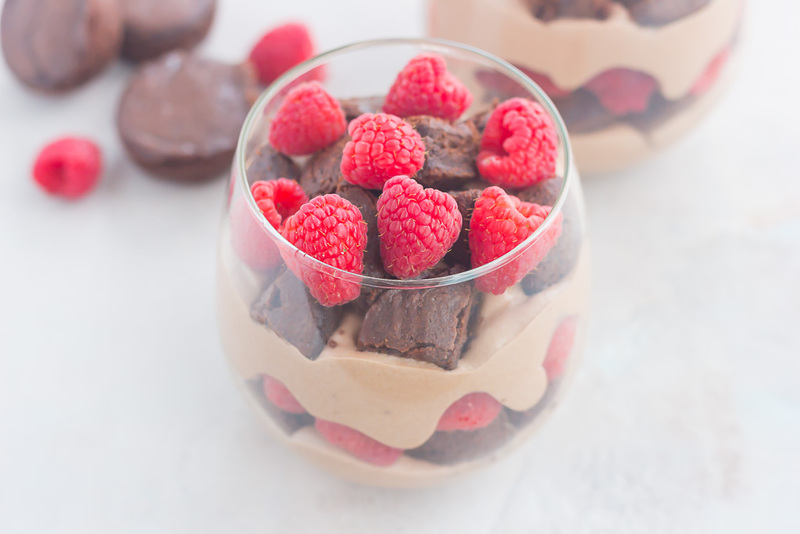 Rich brownie chunks and fresh raspberries are layered together with whipped chocolate pudding to create the perfect sweet treat! In a medium bowl, whisk pudding mix and milk for 2-3 minutes, or until starts to thicken. Spoon about 1/4 cup of pudding mixture into the bottom of a glass or small jar. Place about 1/4 cup brownie chunks on top of pudding, followed by a layer or raspberries; repeat with another layer in each glass/jar. Repeat with rest of jars. If using a medium trifle dish, repeat the layering process, ending with pudding. 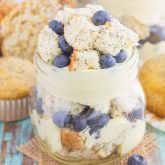 I've loved pudding forever so these pretty little parfaits are calling my name! Adding chunks of brownies for texture (and more chocolate!) was a great idea, and those fresh raspberries are the perfect topper. I would absolutely love these! Thanks, Marcie! It makes such an easy dessert!